Successfully Added Road King Pro Car Multimedia Player (Dual Core CPU, SiRF Prima GPS, 10GB) to your Shopping Cart. TOP STAFF PICK! Following on the huge success of its predecessor, the best selling Road King 7 Inch High-Def Car DVD Player with GPS and DVB-T, we're proud to announce The Road King PRO!!! This futuristic in-dash car entertainment, navigation, and communication supersystem features the top of the line SiRF Prima Dual Core 600Mhz Processor, the SiRF GRF3i+ GPS Receiver, 128MB of Mobile DDR RAM, a genuine licensed version of Windows CE 6.0, and 10GB of multimedia memory for the ultimate driving experience. Plus The Road King Pro is made by the same ODM factory which produces in-car units for big name car makers Honda, Toyota, and Volkswagen! Powerful Performance: Unlike other car DVD players that contain single core CPUs, The Road King Pro comes with the SiRF Prima Dual Core 600Mhz Processor, The Road King Pro also comes with double the mobile DDR RAM memory compared to similarly priced in-car units. As a result, The Road King Pro delivers double the speed and power of existing car DVD players. The benefit to you? State of the Art GPS Receiver: If you're looking for an in-car GPS navigator that will run today's most powerful GPS software and maps, The Road King Pro is for you. Two things in particular ensure that The Road King Pro will deliver a top notch GPS experience. The Best Hardware - The Road King Pro contains the SiRF GRF3i+ GPS receiver, one of the most advanced GPS chips on the market today and... The Best Operating System - The Road King Pro runs a genuine licensed version of Windows CE 6.0 for lightning fast and error free software management. The benefit to you? Advanced GPS location fix in a shorter amount of time! What Happened To The DVD Player? : Yes, as strange as it sounds, The Road King Pro is essentially a car DVD player that doesn't play DVD disks. Instead it comes with 10GB of disk storage space (8GB internal iNand flash + 2GB TF microSD card) so you can effortlessly play your downloaded movies and TV shows in the comfort of your car. Think of it this way: Remember how the iPod replaced the Sony Discman? Yeah well it's happening with in-car systems and the Road King Pro is leading the revolution! The benefit to you? Save your entire music collection in your Road King Pro! 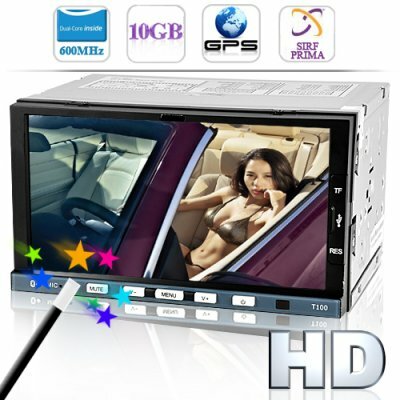 First Class Quality: If you're looking for the best quality in-car entertainment system at the circa three hundred dollar price range, then you'll be happy to know that The Road King Pro is manufactured by the same ODM and OEM supplier which makes in-car systems for Honda, Toyota, Volkswagen, etc. This unit is built to the same exacting standard that the big car makers insist on, so you know you're getting the best with The Road King Pro! The benefit to you? And so much more: If you're looking for the most advanced, top of the line 2-DIN (100mm high) car multimedia player you can buy, you've found it. The Road King Pro is a navigation, communication, and entertainment powerhouse that will transform your car into a rolling command center! It has a 7 inch 800 x 480 high resolution LVDS (low-voltage differential signaling graphics acceleration technology) touch screen and true 4x50W pro audio for car cinema that's out of this world! Plus the Road King Pro comes with a blazing fast 3D graphical interface with iPhone like drag and drop icons, iPod compatibility, twin microphones with noise cancellation for superior Bluetooth conversations when calling handsfree, and dual app functionality allowing you to listen to music while the GPS is functioning and much, much more. 10GB multimedia memory instead of a DVD player! 3 meter magnetic GPS antenna included FREE! Dual Core CPU Performance - this car entertainment system is ultra-responsive. No matter how fast you jump from menu to menu, you won't experience lag or system errors! By removing the DVD player module from the unit, that left room for more processor components while keeping the overall weight of the product lighter so shipping costs are lower. Furthermore, by opting for a DVD player-less in car entertainment unit, your media doesn't skip when the road gets bumpy,and you don't have to carry around a heavy stack of DVD disks! Display screen is covered by thin plastic protective film. For better visual quality, please remove this screen protector. Two menu modes: Sliding Touch and 3D Pivot. Draggable icons that can be re-arranged iPhone-style. Comes with a 3 meter GPS magnet antenna to significantly boost your GPS signal reception. I need to know what actual GPS software runs on this system? Good question. When buying GPS software, make sure it meets the following criteria. It can handle the SiRF Prima chip, as well as for 800 x480 resolution, 128MB RAM, default 9600 baud, and communicates on COM port 1. When I am pairing my cellphone with The Road King Pro, what is its device name and password? The Bluetooth ID is "PND" and the password for pairing is "8888"
Where can I find some great wallpapers for customizing my Road King Pro desktop? We like [http://www.desktopnexus.com/] or [http://www.deviantart.com/] and of course Google images is great too! The touchscreen uses LVDS technology. What is that and how is that good? For the full explanation, check out [http://en.wikipedia.org/wiki/Low-voltage_differential_signaling]. Basically it's an advanced graphical acceleration hardware technology. What makes the SiRF Prima chip so special? It's the 5th and latest generation GPS chipset by the world's leading GPS chipmaker, NASDAQ traded SiRF technology (SIRF). Where can I get some good ebooks to take advantage of the Road King Pro's text to speech audio ebook function? We like [http://www.gutenberg.org/] or [http://www.truly-free.org/].